Here are my character designs for the Flash short. These are the preliminary, so they may change when I get feedback. The hunter is a character I actually designed a while ago. 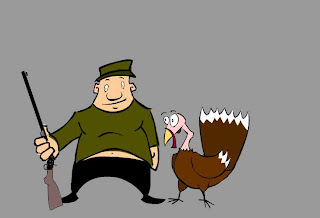 If you flip through my archives you'll see him, but the turkey is a design that hasn't been posted before. Let me know what you think! Like the designs, but I think the turkey's tail may need a little more work. I'll play around with it, thanks for the feedback.